Two new reports published within days of one another have outlined the difficulties inherent in continuing anything close to “business-as-usual” for oil and gas companies around the world, and the increasing pressure to begin transitioning to low-carbon operations. The first report, published by the Transition Pathway Initiative (TPI) — a global asset-owner led initiative which assesses companies’ preparedness for the transition to a low carbon economy — assessed corporate public disclosures made by the 10 largest publicly-listed oil and gas companies and found that only 2 have set long-term ambitions which are compatible with the emissions pledges made by governments as part of the Paris Climate Agreement. Specifically, only British-Dutch oil and gas company Shell, and French competitor Total, have set long-term ambitions, but even so, these are not yet ambitious enough to align with a pathway that limits global warming to 2°C or below before 2050. 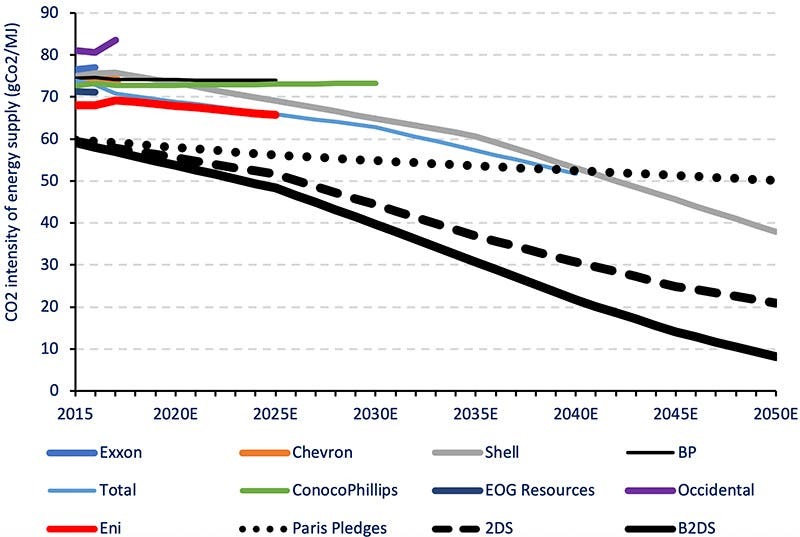 The report also showed that BP, ConocoPhillips, and Eni have each set emissions reduction targets over the coming decade, but that these targets only reduce the companies’ carbon emissions intensity by a small amount, and are focused on their operational emissions (Scope 1 and 2). The remaining five oil and gas majors — Chevron, EOG Resources, ExxonMobil, Occidental, and Reliance — have set no quantified targets to reduce their emissions. The Transition Pathway Initiative’s report, Carbon Performance Assessment in Oil and Gas, was explicit in focusing on the oil and gas industry’s Scope 3 emissions — those emissions that derive from the burning of a company’s product in electricity generation. In other words, while Shell and Total are not responsible for the actual burning of their product, they are nevertheless indirectly responsible by having extracted and provided the product. Scope 3 emissions account for the largest share of these companies’ lifecycle emissions and often account for over 80% of a company’s carbon emissions footprint. The bright spot from the research was obviously the ambitions that have been set in place by Shell and Total — both of which have set in place ambitions to reduce both their operational emissions as well as emissions from up and down their value chain — a move which brings the two companies in line with the Nationally Determined Contributions (NDCs) made by governments as part of the Paris Climate Agreement. These ambitions serve as isolated but important shifts away from business-as-usual for the oil and gas industry and are representative not only of the importance of such ambitions, but the increasing pressure coming from without — such as investors, banks and financial institutions, and the global fossil fuel divestment movement. 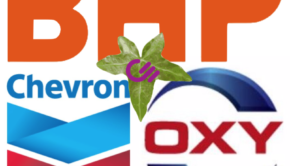 Only a few days after the Transition Pathway Initiative’s report, environmental non-profit and investment research provider CDP (formerly the Carbon Disclosure Project) published a report of its own, entitled Beyond the Cycle, which ranks 24 of the largest and highest-impact publicly listed oil and gas companies on their business readiness for a low-carbon transition. The companies represented in the report account for 31% of global oil and gas production and 11% of proved reserves. The report found that Norwegian multinational energy company Equinor remains convincingly in first place, followed by Total, Shell, and Eni all ranked closely together in the next three spots. CDP highlighted the role of European companies, which come out on top in most key areas thanks to a large-scale pivot towards portfolios made up of natural gas, setting climate-related targets, and investing in low-carbon technologies. Specifically, European oil and gas majors account for 70% of current the industry’s 7 gigawatts (GW) worth of renewable energy capacity and nearly all of the 10 GW worth of capacity under development. Unsurprisingly, US-based oil and gas majors have not diversified to the same degree. Even with this, however, CDP found that since 2010, the 24 companies from the ranking invested only $22 billion in alternative energy, and that low-carbon spend will remain low, expected to account for only 1.3% of total 2018 CAPEX. “Low-carbon technologies and regulatory change is disrupting the established order of the energy industry,” said Luke Fletcher, Senior Analyst, CDP. “The shift to a low-carbon economy presents the question of what role oil & gas companies will play in this transition, and what their strategic options are in the more immediate and longer term. Equinor’s recent rebrand to a broad energy company, expecting to invest 15-20% of CAPEX in new energy solutions by 2030, is symbolic of this shift. Companies are pivoting towards less polluting gas and reducing exposure to oil sands. Across the 24 companies, the share of production from gas has increased at an average rate of 1.4% per anum since 2002. Five companies have also recently divested from oil sands assets. 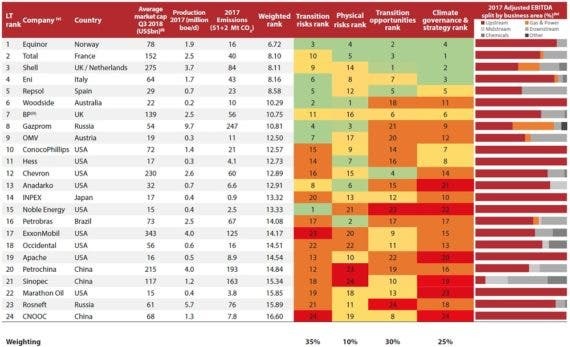 New analysis shows 15 of the 24 oil and gas companies have now set climate targets, with Repsol, Shell, and Total the most ambitious. 10 companies are involved in Carbon Capture, Utilization, and Storage (CCUS) projects and collectively account for 68% of current global capacity. Expertise in this technology may form part of the oil & gas industry’s social license to operate in the coming years. Given 90% of the industry’s carbon footprint is from the end user (Scope 3), managing these emissions is key for the sector’s ability to be more sustainable. 18 companies disclosed Scope 3 emissions. Efficiency remains an issue in the industry and needs to be addressed. On average companies are losing 3.3% of their natural gas production through flaring, venting and methane leakages – worth almost US$5bn at the current gas price. In the end, it is clear to see that the tide is turning for the oil and gas industry, but it is a low tide, one which will take years to fully develop and begin to sweep away the dross of decades. “It’s hardly surprising that so few oil companies are taking their climate responsibilities seriously,” concluded Ben Ayliffe, Senior Strategist with Greenpeace International. “This is an industry whose entire business model is predicated on the practically endless search for and production of more oil we cannot afford to burn. These companies have often been a regressive force in global climate politics and, despite the need for urgent action to reduce emissions being crystal clear, are determined to open up vast new oil frontiers in areas like the Amazon Reef, the Arctic, Patagonia and the Great Australian Bight. Big Oil’s willingness to pay only lip service on tackling climate change is why millions around the world have taken action to resist their operations.